Lau tha, which can be translated simply as hotpot, appeals to the taste buds of sophisticated diners because this special dish of Phan Thiet City in Binh Thuan Province not only looks beautiful but also tastes delicious. Lau tha features numerous ingredients such as rice vermicelli, pork bone broth, boiled pork slices and egg cuts, steamed shrimp, fresh mai fish or cucumber, star fruit, mango, tomato and onion slices, herbs and baked rice paper with sesame. The dish is usually served in two different ways. First, you can place in a bowl some rice vermicelli, some mai fish already dipped in the broth and the remaining ingredients before spooning the broth into the bowl until it soaks up all the ingredients. The dish is then topped with breaks of the baked rice paper and herbs. The dish is also eaten in another serving, in which the sauce of ground peanut and sesame replaces the broth before breaks of the baked rice paper and herbs are put in. Fresh chili slices will whet the appetite of spicy food lovers. You can try the healthy lau tha in both servings. However, locals advise visitors to try the serving with peanut sauce before the one with the broth, as they can enjoy to the fullest the fresh taste of mai fish mixed with the buttery flavor of peanut sauce and the aroma of herbs. 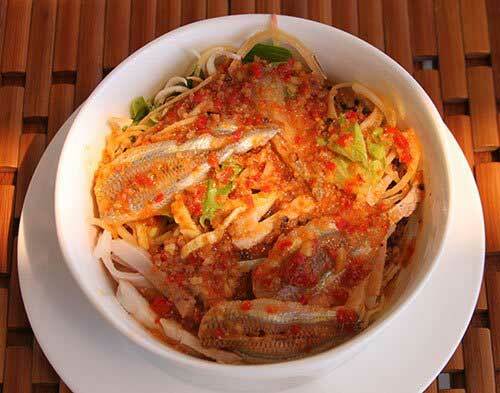 Lau tha is available for serving at the main restaurant at The Cliff Resort and other resorts as well as food outlets in Mui Ne, which is also known as the kingdom of resorts in the central province of Binh Thuan.